As a card-carrying geek, "pi day" has always meant March 14th to me. But in 2012, May 19th became "pie day". It was the 40th birthday of my good friend and graduate school classmate, Scott. His wife engineered a "pie party" for him in which guests brought their favorite pies in lieu of gifts. Pie-centric feats of skill (not involving the gift pies) were scheduled for the mutual delight of both participants and those watching from a safe distance. Unfortunately, Scott lives in Allentown, PA, a ten hour round trip drive by car. Fortunately, the weather was perfect and general aviation came to the rescue again! I arrived at the Le Roy airport under a clear sky with my favorite pie, a Wegman's Triple Berry with crumble topping, riding shotgun in the Honda. From the gate, I was greeted by the sight of Larry's freshly-washed RV-6A gleaming in the sun. Surely, there could be no better advertisement for fun and adventure aloft. It was going to be a good day to fly. En route, I stopped at Dansville for lunch and lingered to watch a yellow Piper Pawnee tow gliders into the rising air generated by the surrounding terrain. I witnessed a pilot pre-flighting the elder statesman on the field, a magnificent Naval Aircraft Factory N3N biplane. I longed to join him and hear wind whistling through the wires once more. The next stop was a new airport to me, Bradford County airport in Towanda, PA (N27), where fuel was $5.29/gal. Per comments on Airnav, I expected a friendly country airport. What I heard on the radio while inbound certainly confirmed that general impression. As I called on Unicom from five miles out, a Cessna 150 warned that it was back taxiing runway 5 for departure, but added that it would be out of the way by the time I reached the pattern. A Jet Ranger helicopter landed for fuel, exchanging some good-natured banter with folks on the ground. From the direction of my approach, a mountain (in PA terms, not Colorado terms) blocked my view of the airport. Upon inferring that the airport lay on the other side of the mountain, I maneuvered for a left downwind entry on runway 5. In position to enter the pattern, I could see the C-150 making its way to the departure end of the runway. I spotted the Jet Ranger on the ground next to a large white fuel tank. Ah-ha, the location of the fuel farm. Piece of cake. I landed and exited on the first available taxiway. Not being accustomed to operating around helicopters, I wondered where I should park to take on fuel. I did not want to park too close. As Warrior 481 and I rolled along the taxiway and closer to the fuel farm, I realized that something was wrong. Behind the helicopter was a single tank labeled "Jet A". I needed aviation gas, not Jet A, and I did not see another tank. I brought the Warrior to a halt on the taxiway and looked around. Farther ahead, on the next ramp over, I could see a Cessna parked near what looked like an automated fuel kiosk and a box that might have been a pump. I could not see a tank, but perhaps it was underground. Though the entrance from the taxiway to the next ramp was quite wide, the self-serve kiosk was placed unusually close to it. The Cessna was parked on the centerline of the ramp entrance, but there was room to taxi around him and onto the ramp, which I did slowly. The geometry of the intersection reminded me of the pinch point created by the old fuel farm at Buffalo-Lancaster Airport. It sat at the intersection of two ramps and a taxiway connecting both to the runway. Eventually, that airport created a new fuel farm at a less congested location. After carefully maneuvering onto the ramp, I did a U-turn and parked a safe distance behind the Cessna, whose pilot was done fueling. Once the Cessna taxied off toward the T-hangars, I taxied close to the pump and well off the center line to allow better access for aircraft movement between the ramp and taxiway. While I was fueling, a pickup truck stopped behind the Warrior and the Cessna pilot emerged. "Hi, how are you?" I asked jovially while monitoring the flow of fuel into my tank. The man ignored my greeting and immediately started to berate me for taxiing too close to his Cessna. I was stunned. I have often been on ramps where aircraft taxied much closer to one another than ours had, including the very next day at the Williamson-Sodus fly-in where high and low wing airplanes avoided ramp rash solely by virtue of vertical wingtip separation. I am not confrontational by nature and worked to stay calm. I mildly told him that I took great care to maintain adequate separation and did not think I passed too close to him. "But it WAS too close," he screamed at me. "And people that scratch my airplane piss me off because they make me late for work!" But there was no contact between our airplanes, no scratches imparted, and any issues with his work schedule were clearly his own. He went on to ask why I did not use the other ramp entrance while pointing to the other side of the long ramp. No taxiway was visible from our location, but presumably, there was a connection over there that I simply could not see. "I'm sorry," I said. "I'm not familiar with the airport and did not realize there was another connection." He looked at me like I was the biggest idiot to ever cross his path. "Where do you think that taxiway goes." he pointed to the parallel taxiway running along the runway. "The end of the runway," I answered. He started to say something else, but stopped. I could see in his face that he realized I had a valid point. Airplanes cannot simply back up and taxiing into a blind alley on a narrow taxiway in hopes of finding a ramp connection is not something I consider to be a good idea. At this point, he mumbled something unintelligible, stomped back to his truck, and roared away. There was not much more that I could do but shrug and return to fueling. I am not entirely sure what inspired such a vehement reaction. Was it "ramp rage"? It would have been entirely appropriate for him to let me know that there was another entrance to the ramp that I could have used. Perhaps it was local habit to block that taxiway while fueling, forcing ground operations to occur via the other ramp entrance. But screaming at me when no harm was done? That was a waste of time for both of us. Did he think I wanted to scratch my airplane, which for the record, had the superior paint job? Did he think I was out to harass him personally? Was he just having a bad day? Perhaps he went home to whomever he goes home to and boasted with great satisfaction about the dressing down he gave to a young whipper-snapper. So, to whoever you are, I am genuinely sorry that my actions made you uncomfortable. Suggestions and recommendations from knowledgeable local pilots are always appreciated, but it seems to me that there are more constructive ways to convey that information. I called Scott to update him on my progress. "How's the flight?" he asked with his usual enthusiasm. I laughed. "Well, the sky is blue, the wind is calm, and I've just met the biggest jerk that I have ever encountered in ten years of aviation." Pennsylvania is absolutely beautiful from the air with its varied terrain and interesting contour farming formations. 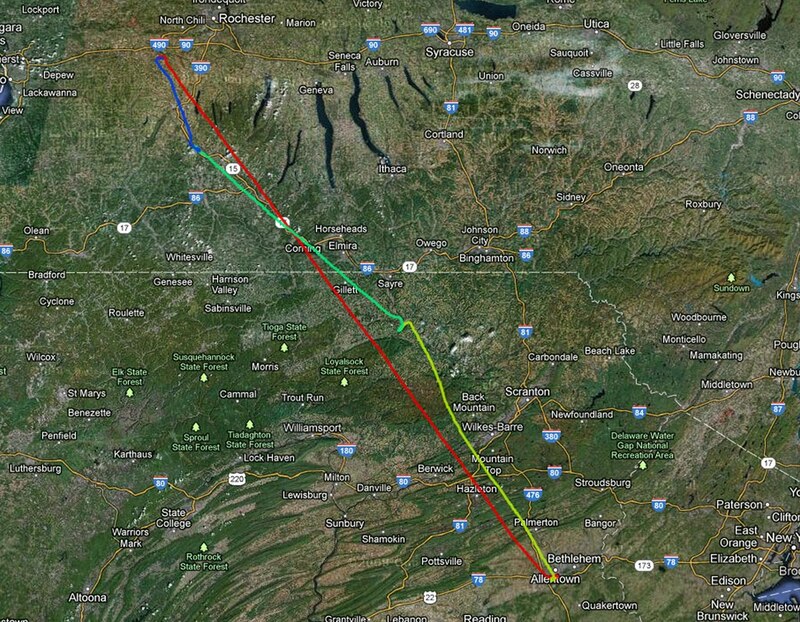 My final destination at Queen City airport (XLL) lay 45 minutes ahead, situated southwest of Allentown's city center. I settled in for a relaxing flight over the reservoirs and ridges of northeast Pennsylvania. I must confess that once I was on frequency with Allentown Approach at Lehigh Valley International (ABE), I could not get Billy Joel's "Allentown" out of my head. As I entered the Allentown area, I noted the above quarry. As it turns out, the quarry is so close to Scott's house that I was only a mile away from Scott (horizontally, not vertically) when I took this picture. I did not have much time for sightseeing in Lehigh Valley International's Charlie airspace. My route of flight took me directly across the approach path of runway 6, which was active that afternoon. At one point, runway 6 lay off my port wing and the landing light of an inbound regional jet was to the starboard. Because I was flying across landing traffic, Allentown approach kept very careful tabs on me. As I reached the traffic pattern for runway 7 at Queen City, my head on a swivel, I was finally released from flight following with a brisk, "Warrior 481, no traffic observed in the vicinity of Queen City airport, squawk VFR, frequency changed approved, have a good day!" For me, it was a bit disconcerting to be in the pattern at an untowered airport and not on the Unicom frequency, but I had monitored it and the automated weather observation station while inbound and chose an appropriate runway for landing. This decision was validated when I saw another aircraft on a taxiway below making its way to the departure end of runway 7. Within moments of clearing the runway, Lehigh Valley Aviation Services called on the radio and guided me to parking. I was met at the airplane, chocked, told that there would be no parking fee for the few hours I would be there, and provided with a gate code to get through the airport fence after their 6:00 pm closing time. The fellow I met was extremely friendly, helpful, and efficient. It seemed like a nice place, but unfortunately, I could not linger to chat. I was already late in meeting my ride. I have known Scott for nearly eighteen years. In that time, he has met my parents, Kristy's parents, and several other members of our collective family. Strangely, it was my first time meeting Scott's father, Steve. Steve was my ride to Scott's house on the outskirts of town. But first, we had a mission to complete: find the bus station in Allentown and pick up another of Scott's inbound friends. The trick here was that Steve was unfamiliar with Allentown and had, at best, a love-hate relationship with the little woman living inside his Garmin GPS. Steve and I had a bit of an adventure in the heart of Allentown, particularly given the Garmin's predilection for taking us down streets that felt more like back alleys. We eventually made it thanks to a combination of GPS assistance, careful attention to detail, some aggressive driving (where warranted), and a not inconsiderable amount of dumb luck. With Kelly (I am terrible with names, but am 83% that I have this one correct) safely on board, Steve began navigating back to Scott's house. Along the way, I could not help but take note of streets like Orefield Road and Lime Kiln Road that struck me as so evocative of the region's history. As it turns out, Wegman's Triple Berry is a favorite pie of Scott's wife, Kate. The pie survived the journey intact and our hostess was pleased with me. While there, I became reacquainted with Craig and Heidi. The last time I saw them was in their apartment near the Pentagon nearly ten years ago. My primary memory of Craig was that he prepared an amazing, multiple course meal for us. Scott wore a blue ribbon indicating him to be the "birthday boy". Considering that this was his 40th birthday, I asked him if he started the day a "birthday boy, but would return a birthday man" (thank you, Chris Elliot). The fun and games started innocently enough, with two teams carrying flimsy pie tins full of water across the yard, each vying to be the first to fill their respective buckets. The pie-related events escalated, finally devolving into a pie ingredient battle royale. It ended with a mixture of adults and children (including me) wandering dazedly across the field of battle, clad in plastic ponchos augmented with safety goggles, and smeared in whipped cream that rapidly melted under the hot sun. The birthday boy was completely coated with whipped cream accentuated by candy sprinkles and chocolate Jimmies. As I panned my gaze across the aftermath, I thought I detected a faint strain of Barber's Adagio for Strings. Scott's party, like Scott, was unabashedly fun, full of life, and perhaps a little juvenile. Steve and Fredda, Scott's parents, dropped me off at the Queen City Airport on their way out of town. Fredda wanted to see the airplane, so I brought her through the gate with me and posed for pictures in my whipped cream stained shirt. Steve offered to wait until I was rolling for take-off, but I still needed to contact Flight Service and did not want to delay them. I expressed my gratitude for the ride and watched them depart. Alone with Warrior 481, I contemplated the airport facility. I have read numerous articles in the news about Queen City airport being under siege. The mayor of Allentown, a vocal member of the airport authority, wants to close -- or at least drastically reduce the footprint of -- the airport. This would be a shame. The airport features crossing runways (3159 and 3949 feet long) in excellent condition. According to AirNav, there are 75 aircraft based on the field and an average of 148 operations occur per day (12 month period ending October 25, 2011). By all appearances, it is a vigorous, healthy airport that is the local center of the general aviation universe. I hope that local pilots and the FAA are able to fight for this airport. It appears to be well worth saving. Queen City's challenges represent those faced by many communities within general aviation. If places like Queen City Airport are closed, where will new pilots train? Where will air ambulance, mercy flights, private flights, or business flights be based? Larger airports (unfortunately regarded by the general population as "real airports") simply cannot accommodate such a mix of traffic and, in that sense, airports like Queen City and Le Roy provide valuable relief to nearby commercial facilities. GPS ground track of the round trip where the red line shows the return flight. Flying home in a darkening sky, I realized that it was a great day. I ate some wonderful pies, celebrated with a good old friend, visited a couple of new (to me) airports, watched gliders being towed aloft, got lost in Allentown, tossed whipped cream pies at veritable strangers, and landed at home just as the red disk of the sun slid below the horizon. What a fun, exhausting day! Of course, I also had someone scream at me, but the pluses more than compensate for the minuses. A friend of mine who lives in Tampa finds it amazing that any crop can grow in Upstate New York at all. "It's too cold," he insists. He looks at me skeptically when I describe how much of New York is farmland. 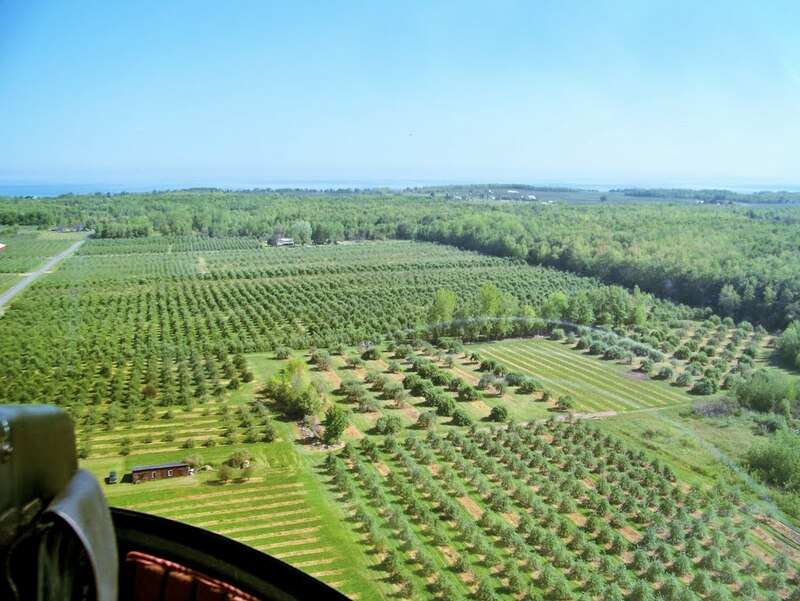 Despite my friend's climatological snobbery, any overflight of Lake Ontario's south shore will reveal field after field of neatly arranged fruit trees. If I were to tell my friend that Wayne County (the next county east from Rochester) is one of the top apple producers in the nation, I am quite sure that he would be dubious. But it's true. Wikipedia even says so. The Williamson-Sodus Airport (SDC), cleverly named for its position between the rural metropoli of Williamson and Sodus, lies in the heart of orchard country along Lake Ontario. In the third week of May each year, the town of Williamson (where Mott's has a significant presence) celebrates its Apple Blossom Festival and the airport hosts a terrific fly-in breakfast. This year's festival was bittersweet. The early warm up followed by a killing frost earlier this season means that much of the region will fail to produce fruit in 2012. Since she was two years old, The Bear has known the difference between helicopters and airplanes. She will often thump her chest in imitation of a rotary wing's distinctive "whump-whump-whump" as it cuts through the air. My friend Ray (this would be "mechanic / helicopter pilot" Ray, not "airport-owning / patron saint of aviation" Ray) flies helicopter rides each year at the Apple Blossom fly-in. I promised The Bear that she could get her first helicopter ride with Ray. This promise incited much enthusiasm, particularly because lousy weather forced me to renege on the same promise made in 2011. The traffic pattern at Williamson-Sodus was hopping when we arrived over the field at 8:30 am Sunday morning. Fly-in visitor aircraft were coming and going, several other airplanes were flying rides for drive-in visitors, and Ray was maneuvering the helicopter north of the airport below all of the fixed wing chaos. After landing, we were carefully marshaled to parking on the crowded ramp by a group of well-organized volunteers. Because the ramp is relatively small and there was a single taxiway available for access that morning, well-orchestrated ground traffic control was essential. As we walked through the crowd, I pointed out Ray's helicopter to The Bear. "There's the helicopter you're going to fly in." The Bear minced no words. "Pancakes first," she stated firmly. Clearly, the little hobbit was ready for second breakfast. Along the way, we encountered Joe, one of the organizers. Joe introduced us to Randy and Dave, both denizens of the AOPA flying forums with whom I had interacted on-line, but never actually met. The Bear insisted on two huge pancakes and ate them all. Predictably, no orange juice was available, but the Mott's apple juice was flowing freely. Careful examination of the above picture will show where The Bear's first cup of apple juice flowed freely across the table. She was quite happy to drink mine in addition to the replacement I found for her; that kid can really put away the apple juice! After breakfast, we wandered over to where B.A.C. Helicopters was staging riders and paid for our tickets. Soon enough, Ray appeared above us in his Enstrom 280-F helicopter. The chopper settled gently to the ground, disgorged passengers, and loaded up with new riders. I don't think Ray had any rest that morning. While we waited our turn, Lance performed the seat belt demonstration. He crouched down low and looked The Bear in the eye. "Now, I know you already know how to do this, but the FAA says we have to show you." The Bear cast a suspicious look in my direction. "So, if we screw up and fall out of the helicopter, Lance can say, 'hey - we told 'em'," I added. Lance grinned and nodded at the practical reality of my comment while he finished his demo. When Ray returned, we followed Lance out to the helicopter doing that half-crouch, half-run thing that I first saw on M*A*S*H as a kid. The Bear embarked first, I cinched down her seat belt (good thing we had the demo), then climbed in next to her. Ray and I shook hands in greeting and Lance took our picture. Without much ado, we climbed into the air, just a few hundred feet off the ground. We departed opposite the direction of landing traffic, making a right pattern to the north of the airport. Ray never climbed above 600 feet. We flew low over the orchards, not quite reaching Lake Ontario. Not accustomed to flying so low, I felt like we were skimming the tree tops (we weren't). My shirt sleeve flapped in the slipstream from the open door. "How are you doing, Little Bear?" I asked. "Good!" she bellowed with enthusiasm and snuggled up against my side as the farmland rolled along beyond the clear bubble at our feet. At the end of our ride, the airport materialized as a clearing in the trees and we settled back into Ray's landing spot. Lance had the next pair of riders waiting. I do not know how long Ray hopped rides that morning, but we still heard him on Unicom as we landed at Le Roy. The Bear was pleased with her helicopter ride, but it had been an early and exciting morning. She was clearly tired. While we were admiring a Yak-52 on display, I mentioned to her that it was for sale. "Daddy," she said in a tone reserved for the impossibly dense, "we already have an airplane." "I thought this one could be yours," I suggested. "Daddy," she said with a whimper. "I'm sleepy - can we go home now?" Back at Le Roy, after her power nap and a fruitful morning of thinning the herd of insects populating Upstate skies, The Bear helped me clean the wings and cowling of the Warrior. Then she sat at her workbench and eagerly asked to sign my logbook. Another exciting event in the life of a young aviatrix had come to an end and the day was not even half over! She could not wait to see Kristy and tell her about the helicopter ride. Thanks to Joe, Randy, Ray, Lance, whoever mowed "10" into the grass at the approach end of the runway, and the rest of the folks from the Williamson Flying Club for holding such a terrific, well-organized fly-in! Later that day, I received a message from Joe saying that they served 1800 breakfasts that morning. That is a lot of pancakes! This morning, I made a lunch hop with friends. With the Silver Wing in St Mary's, Pennsylvania temporarily closed, it made sense to give Puddle Jumpers in Fulton, New York another try. Dan and Devon were accustomed to flying with me, Nicole was not. I studied the wind carefully before convincing myself that I was comfortable taking someone new to light aircraft aloft on such a day. There was some mild chop down low, but once everyone verified that they were sufficiently comfortable in the pattern, we left the vicinity of the airport. We climbed to 5500 feet and were rewarded with extremely smooth air. Although our departure and destination points were both clear, a low overcast hung over the waterfront, dipping inland from northeast of Rochester to Fair Haven, NY. East of Irondequoit Bay, the ceiling solidified. I wondered for a moment if I had misread the weather and that Fulton was overcast as well. But beyond the edge of the ceiling, I could see the power plants just north of the Oswego County Airport. The overcast was a highly localized phenomenon that existed between reporting points. Lunch at Puddle Jumpers was tasty. I tried that half pound stuffed mushroom and Swiss burger that I eyed on my first visit, but lacked the gut capacity to tackle. It was good. The meat was very flavorful and my mouth is starting to water just writing about it. To paraphrase Devon, had the kitchen not been visible, we might have thought those burgers came from heaven (our waitress was very amused by her comment). For the return flight along the lakeshore, the clouds had burned off and the air was extremely clear. The ride home was absolutely beautiful. East Bay in the foreground, Sodus Bay in the background. I know that I post a lot of pictures of this bay, but I think it is just so darn photogenic. It is always a pleasure flying with people who appreciate it. I later learned that Nicole was not new to general aviation, but had logged a single, unpleasant, experience many years before with an uncle. Kudos to her for giving it another try. I am happy to report that she had a much better experience this time around.